Happy new year then. I have been living in Zürich for a week and things are slowly settling down; the press review thus resumes. This past few weeks we saw once again rising tensions among major petroleum exporting countries on the backdrop of sliding prices. Brent is back to prices of 2005, prompting ridiculous petrol and diesel prices at forecourts. The open rattling between Shiites and Sunnis has occupied much space in the media, but markets remained unmoved beyond the prospects of escalation. Beyond this Saudi-Iran spat, Daesh took again the new year to launch a major offensive, this time targeting Libya. Suicide bombs, attacks on petroleum infrastructure, Daesh wants Libya and wants it bad. Earlier this week a few tabloid media in the UK reported the imminent deployment of an expeditionary force to Libya, 6 000 soldiers leaded by Italy and including sizeable contingents from the France and the UK. Recall here this post from last April, when I postulated such military operation as inevitable. The tab is up for payment. Crack SAS troops are in Libya preparing for the arrival of around 1,000 British infantrymen to be sent against ISIS there in early 2016. Special Forces including military close observation experts from the Special Reconnaissance Regiment are spearheading a major coalition offensive against the terror network. The operation will involve around 6,000 American and European soldiers and marines - led by Italian forces and supported mainly by Britain and France. It comes in a bid to stop the advance of around 5,000 Islamic extremists, who have already secured more than a dozen major-oilfields to swell their war chest of millions of dollars. The fact that "serious" media did not follow up on this story possibly means the source is weak or could not be corroborated. However, The Telegraph put up an interesting article leaving a clear sense that something is about to happen. Pressure for British troops to be deployed against Islamic State militants in Libya grew on Monday after the terror group attempted to seize the country's largest oil depot. At least two people were killed when Isil fighters launched a combined gun and suicide car bomb attack on the Sidra oil port on Libya's Mediterranean coast. A rocket fired into a 420,000 barrel oil tank also sparked a huge blaze. Sidra lies around 130 miles east along the coast from the late Colonel Gaddafi's home city of Sirte, where Isil first raised its black jihadist flag a year ago. The prospect of Isil also grabbing lucrative oil facilities will increase pressure on Britain to press ahead with a plan to send troops to help Libya's fledgling government push Isil out. Muhamar Kadhafi was executed in consequence of a crack down on popular protests that left some 50 dead during various weeks of clashes. Daesh needs only a car bomb to beat that score. An Islamic State affiliate in eastern Libya claimed responsibility for a suicide truck bomb attack targeting a police base in the town of Zliten that authorities said killed at least 60 policemen and wounded around 200. In a statement posted on the Twitter accounts of IS sympathizers several hours after Thursday's attack, the group calling itself the IS Barqa Province said it was carried out by Abu al-Abbas al-Muhajir, who detonated his explosive-laden truck among the Libyan border police at the base. The last name, al-Muhajir, implies that the attacker was not Libyan. From their experience in Syria and Iraq, Daesh leaders know all to well the crucial role of petroleum in war. And if you can not control it, make sure it does not fall in your enemy's hands. Islamic State militants clashed with security forces near Libya's Es Sider oil export terminal on Monday killing two guards, while an oil storage tank at nearby Ras Lanuf was set on fire during fighting there, witnesses and a guard said. A spokesman for Libya's National Oil Company (NOC) said the tank was holding about 400,000 barrels of oil. The NOC was still trying to put out the fire late on Monday evening. Let us go back to Saudi Arabia to get a proper grasp of who was sheik al-Nimr, the Shiite cleric recently executed. It is interesting to see at this distance the calls for mercy from our leaders regarding his nephew, and compare them with the impassivity of today. Qui était Nimr Baqer al-Nimr, le chef chiite exécuté par l'Arabie saoudite? Là-bas, c'est dans la mosquée Imam Hussein que le chef religieux chiite tenait ses prêches du vendredi, très politiquement engagés. Il avait par ailleurs été brièvement détenu à plusieurs reprises entre 2003 et 2008 pour avoir réclamé la remise en liberté d'activistes, davantage de droits pour la communauté chiite dont le droit des enseignants à exercer dans les écoles. Mais c'est en 2009 qu'il a commencé à énerver sérieusement les autorités, en appelant à une sécession de l'est de l'Arabie saoudite, une région majoritairement chiite et de sa fusion avec le royaume proche de Bahreïn. Dans un discours prononcé en novembre 2011, après la mort de quatre chiites dans la Province orientale, le cheikh Nimr avait appelé à «la remise en liberté de tous les détenus au cours de manifestations et de tous les prisonniers de conscience, sunnites et chiites». Au cours des funérailles d'un des manifestants de l'époque, il avait assuré : «Nous sommes déterminés à réclamer nos droits légitimes par des moyens pacifiques». Opinators note that the execution of sheik al-Nimr had precisely the intention of hiking tensions in the region. And in that regard it can be seen as quite a success. Naturally, Saudi Arabia is also sending a message to the West. On more market related news, there is a remarkable unmasking of the "oil glut" mantra put forth by the mainstream media these days. Over-supply is certainly a reality, but we are not in the least drawning in petroleum. Where actually is that much-hyped global oil glut? Let’s have a look at the statistics in the latest IEA OMR of December 2015. 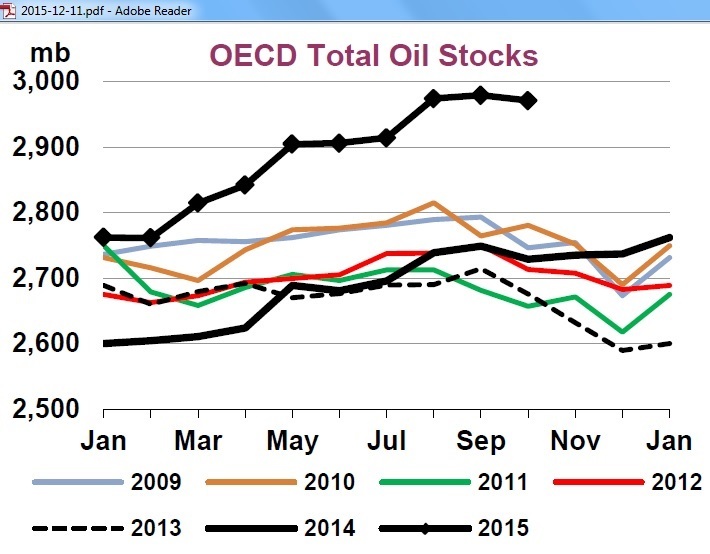 It’s only about OECD stocks, not the whole world. We see that oil stocks in the period 2009 (light blue line) to 2013 (dotted line) varied between 2,6 bn and 2.8 bn barrels along with seasonal changes. The average stocks for this time of the year is 2.7 bn barrels. We can consider this range as the result of normal operating conditions allowing for accidents, refinery maintenance, transport disruptions, strikes etc but also demand side changes from a weak economy (2009) to high oil prices (2013). And here is the weekly account of the torments lived presently by the petroleum industry. One more piece of the puzzle in the Chinese coal extraction collapse. Amid a global oversupply of steel, industrialized countries plan to urge China to address its excessive production capacity. The 34 members of the Organization for Economic Cooperation and Development, which includes Japan, the U.S. and European nations, plan to convene an emergency ministerial-level meeting in April. China is not a member but is expected to attend. The countries hope to draw up guidelines for China to reduce excess steel mills. They may also look into whether China is subsidizing uncompetitive steelmakers and devise necessary steps to address the problem. A technical note related with the war on/with Daesh, that hardly got any coverage. As far as I am aware, this was the first time an entire country was isolated from the rest of the internet world. The hacktivist group, 'Anonymous' has threatened to hack Turkish airports, military assets and private state connections if the government does not stop supporting Islamic State. The hacktivist group brought down 400000 Turkish websites that included government and police websites after hacked into Turkish servers in a week long attacks. Websites of the government, police, leaders, private banks and major .tr domains were targeted, todayszaman, a Turkish news website reported last Thursday. In addition to the shutting down of the websites, the Anonymous hacktivist group threatened to carry out more cyber-attacks if the nation continued to support Islamic State militant group. The big picture. Amidst geo-political tensions and market turmoil, it is always useful to step back and look at the entire plot from afar. Closing on a comical note, hat tip Chris Eykamp. Warning: this video contains strong language, watch it at your own peril. And that was the first press review of 2016. Enjoy your weekend.